Wrap Me Up In Butter and Call Me Good! Thursday, May 29th, is one of my new favorite days. It will be a day that I will celebrate forever– along with birthdays, anniversaries, and holidays. This day will be celebrated as one of the BEST DAYS OF MY LIFE!!! This day will be celebrated as the day butter changed my life! Yep, you heard me! Butter changed my life. Body Butter, to be exact. Yummy Body Butter that smells like Key Lime Pie. Yes, From this day forward, Thursday May 29th, will be known as “THE best day of my life!” (Well, along with my Wedding day and the births of my children, but you know, you HAVE to say that!) Because that was the day I got my Body Butter Drench from The Sego Lily Day Spa. Now I must admit, I haven’t had many Spa experiences. I’ve always thought of them as “luxuries” and never made the time, or saved the money, to go in and get one. You know how it is when you are a Mom and a Wife, you get in the zone, the “I-don’t-have-time-to-shower-let-alone-anything-fun!” zone. Your day turns into feeding the kids, driving the kids, refereeing the kids, getting fruit snacks, playing with kids, doing laundry, more refereeing, more laundry, cleaning, cooking, more cleaning, more refereeing, helping with homework, more laundry and the The Hubby gets home and it starts all over again. You dream all day long of a break, but you know that will only happen when you get to make a quick run to the grocery st ore, ….. without the kids, …..to pick up Toilet Paper! This is where Sego Lily Day Spa comes in. And let me tell you, for those of you like me, you feel like you just don’t have the time or the money for such a luxury,but let me tell you, YOU DO!!! Because here is a secret, …………..it’s not really a luxury. Let me explain. Food, water, and shelter are the basic necessities. .. . . AND Sego Lily Day Spa! I’m a HUGE believer in the phrase “happy wife=happy life!” From the time I first made my appointment, I was happy! I had something to look forward to! Something to make listening to the kids fight a bit easier, to make potty training a bit more pleasant, to make laundry a bit less “never-ending!” Knowing I had a Spa treatment made life SO MUCH BETTER! And don’t we all need that!?! I arrived at the Layton location and let me tell you, GORGEOUS!! I was trying to take mental pictures of everything because I want to re-do my master bedroom and bath to be JUST like this place. I mean the chandelier in the dressing room was amazing. If I had brought my bigger purse I would have tried to take it home with me! I took a tour of this place and it was magical. You HAVE to check out the couples massage room with the bathtub! Ya, you know what I will be giving The Hubby for Father’s Day, it’s a present for me too! YEAH! I instantly felt at peace, sitting in my bathrobe and slippers in their sitting area. I mean how could you not?!! There was a waterfall, fresh fruit, dried fruit, mood music, leather chairs, throw pillows, throw blankets, and wall sconces, – o my! I was already so relaxed and I hadn’t even started my treatment yet! The massage was A-MAY-ZING!! Ahhhhhh…….just thinking of it now takes me to my happy place! My new best friend, Angela – the massage therapist, was such a joy. In fact all the gals down there were! No one yelled at me, no one asked me for fruit snacks, there was no tattling on one another, and definitely no asking “do you need to go number 1 or number 2?” It was like something I’ve only ever dreamed about. As I was getting my massage I was pretty sure that I was THE luckiest girl in the world to be pampered in such a way. And then Angela started showing me that I had a bit of stress in my body and was pointing out some knots in my muscles. She explained why our muscles do certain things, and how standing one way can effect something that you would never think about. This gal was a fountain of knowledge! 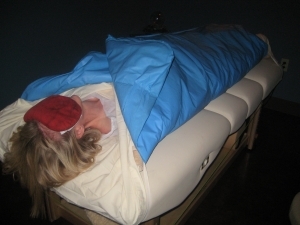 I LOVED the massage, but I think my favorite part was when she wrapped me up like a warm burrito to let all my toxins escape. SO WONDERFUL!! She even took the time after my massage to show me some stretches I could do to keep my shoulders and neck from knotting up and maybe help me out with my headaches! WOW!!! I thought I was going in just to be pampered, but I came out of there CONVINCED that this was so much more than that. That getting “pampered” is vital for my well-being. I learned so much that night. I learned that I need these treatments more than I want them( and I want them A LOT!) and the best part of this whole experience was my massage therapist LOVES her job and I could tell just by talking with her. That speaks volumes about Sego Lily to me! To me it means that they have the same philosophy as me, …….only a little different. Happy therapists=happy, happy, happy clients! After my treatment I was driving home and seriously ALL of my favorite songs were on the radio. I walked in my front door to my house and The Hubby and the kids put all the laundry away, AND did the dishes, AND there was chocolate pie to eat!!! It was a sign from Heaven that I NEEDED this Spa Treatment. It was like everything was made right in the world. Life seemed easier, life seemed happier! In fact, I took some before and after pictures to post on this blog and when I went to upload them to my computer my card reader corrupted all my pictures! Like 1400 of them. I had a wedding shoot, a newborn shoot and a family shoot all on that card and they are destroyed! Normally this would have sent me into a crazy rage and I would have ended up on the 10 o’clock news, but I’m still giddy over my massage! Now I can’t guarantee that this will happen with you, but isn’t it worth going just to find out!?! I think so too!!! So there you have it! Basically you NEED to go to Sego Lily Day Spa. And you NEED to vote for me to be the Sego Lily blogger. Good luck to the other four finalists………but not all the luck, afterall, I really want/NEED to win! https://segolilyspa.com/wp-content/uploads/2018/05/Sego-Lily-Logo-2018-final-white.png 0 0 gwenn https://segolilyspa.com/wp-content/uploads/2018/05/Sego-Lily-Logo-2018-final-white.png gwenn2009-06-06 02:38:502009-06-06 02:38:50Wrap Me Up In Butter and Call Me Good! I, Angie Lucas, have had many massages in my day, but I can state unequivocally that May 27 was the first time I’ve ever dozed off on the massage table. Blame it on Janice and the body butter. Does anyone remember the Seinfeld episode (season 9, episode 1) when Kramer decides to replace his shaving cream with butter because it gives him a smoother shave? He loves how it feels so much that he spreads the butter all over his body and inadvertently starts baking himself in the sun, causing Newman to crave some tender, juicy Kramer turkey? Well my Body Butter Drench experience at the Sego Lily Spa was nothing like that at all. For one thing, this body butter may have the same consistency as real butter, but it has never had anything to do with a cow. Also, a licensed professional is doing the spreading, throwing in a glorious massage for good measure. And the heat source involved in the treatment is decidedly non-solar and, as such, is guaranteed not to cause tanning, freckling, premature aging, crispy turkey skin, or any number of sun-induced blights. And Kramer will be the absolute furthest thing from your mind, so I’m not even sure why I brought it up. I’ve long fantasized about what it would feel like to immerse my body into a bathtub filled with cool, whipped (but not melted) butter. Or to swim in a pool full of Jello in its swirly in-between state—not pure liquid, and not quite set. Well, until I’m independently wealthy, neither of these scenarios is likely to take place. But the Body Butter Drench will do quite nicely in the meantime. You’ll walk through the Sego Lily Spa doors (running late as usual and feeling overwhelmed by a never-ending list of tasks flowing through your head) and enter a blissful oasis. The rooms are cool and darkened. Everyone speaks in hushed voices and they smile kindly when they see you. You’ll be issued a luxurious purple robe and a pair of soothing spa sandals in just your size, and you’ll be encouraged to relax by a crackling fire—partaking of chilled lemon water, assorted teas, and dried fruit mix—until you are summoned for your treatment. You’ll be amazed you’ve never encountered dried kiwi before this day, and you’ll plan on making it a part of your daily diet for the foreseeable future. 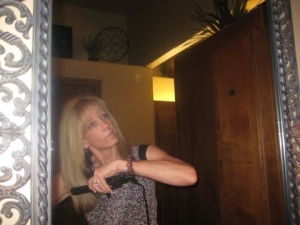 At just the right time, Janice [or insert your massage therapist’s name here] will walk in and call you by name. At this point, you can send your brain on vacation, because Janice is in charge of your every move for the next 90 minutes. She’ll tell you to slip beneath the towel on the massage table, and then she’ll start massaging the lightly scented tropical butter into your right foot and up your calf. All capacity for coherent thought will depart immediately. Janice will soon become just a pair of hands, as far as you’re concerned. She won’t speak more than necessary (no grilling you about where you’re from and what you do for a living and do you know so-and-so from Green River? ), and when she does speak, her voice will be almost tranquilizing. While the heat from the blanket opens your pores and encourages the butter to sink deep into your epidermis, Janice will work her magic on your head, shoulders, and face. She’ll then slowly unwrap you—again preserving your modesty—and quietly tell you exactly which appendage to move and when. She’ll even assist you in sitting up so you don’t have to engage your abdominal muscles. That’s what I call service. While you’re emerging from your cocoon (don’t worry, there are no butterfly metaphors on the way), you’ll have a moment of panic because you’re not ready for this to be over. But you can let that go because Janice still has a full-body massage in store for you. Twenty minutes of bliss ensues. And, if you’re a scrapbooker, you’ll probably take a few surreptitious pictures on your iPhone while you’re there, and you’ll go home and turn them into a layout. After all, you’ll realize, we document the most exciting, memorable, and celebratory moments of our lives, so why shouldn’t we scrapbook our most relaxing moments, too? Janice [or insert your massage therapist’s name here] will ask you if you’d like your stomach massaged. You might be tempted to say no, but I beg you to resist that urge. I’ve never had anything resembling washboard abs, and I can honestly say that in my adult life, only a tiny handful of people have ever laid eyes (let alone hands) on my bare midsection. It is truly my least favorite feature. I know many of you, particularly those who have previously given birth, can relate to feelings of self-consciousness about your abdominal region. But a beautiful thing happens when you say yes to having your stomach massaged. Not only is it surprisingly soothing and relaxing physically, you also get the subtle feeling that this pair of hands is offering you acceptance. You’re okay just as you are, and it feels good. The Body Butter Drench lasts 90 wonderful minutes, and massages can have a tendency to kick certain people’s bladders into high gear. As long as you tinkle right before your treatment, you’ll make it through just fine. Also take care to drink no more than your normal amount before the Drench, then load up on all the fluids you want after it’s over. Plan on squeezing in your daily workout and taking your daily shower prior to your treatment. Trust me, you will not want to wash off (or sweat off) the body butter that has been so painstakingly applied. You’ll want to luxuriate in your coccoon of moisturizing goodness as long as possible. There’s a chance that some residual butter will make its way into your hair. If you have dry hair, this can be a nice side benefit. If you have a tendency toward oily hair (like moi), plan on washing your hair only (perhaps in the sink so you don’t violate tip 3) after the treatment is over, throwing it into a ponytail, or covering it up with a hat. This is especially helpful if you have somewhere important to be later that day, and you’d rather not show up glowing like a newlywed and smelling fantastic but looking like you haven’t washed your hair in the recent past. This tip is optional of course, but I found myself wishing I had brought comfy socks and real shoes to wear home. I didn’t want to slip my glistening feet into my dusty flip flops for the drive home. And that’s it for me. Please tune back in as I (hopefully) begin my year-long journey through every treatment in the Sego Lily Spa menu, sharing my experiences and offering useful tips along the way. To help make sure this happens, please leave a comment right here on this post. Have a blissful, relaxing day. It’s a tough job but somebody had to do it. As a finalist in the Sego Lily Day Spa search for their blogger contest, I excitedly set up an appointment for my complimentary spa treatment that I would happily get to blog about as my final entry. The very kind woman on the phone informed me my treatment was to be a Body Butter Drench that was 90 minutes in length! 90 minutes??? That’s an hour and a half! That’s three episodes of Sponge Bob! 30 minutes short of two hours! Now, I am not sure about you, but I wasn’t sure my body could handle being drenched in rich and luxurious butter for even a few minutes let alone 90! I had visions of my dry and cracking body going into shock from lack of exposure to this kind of luxury. Maybe I needed to start slow, with say… a Body Margarine Sprinkle first? Don’t get me wrong, I am not a member of some anti-butter cult. No, no…not me. I frequently drench many things in butter (i.e….fresh popcorn, hot rolls, steamy baked potatoes, crisp corn on the cob), after which I put them inside my body. It’s just I have never actually placed any kind of saturated fat outside of my body. Nope…never EVER drenched my body in butter. Or margarine for that matter. Bring on the butta baby! Now for someone that has only had ONE massage in her entire life, (belly massages from wanna-be drill sergeant nurses two hours after giving birth – five different times – DO NOT COUNT!) the word excitement just doesn’t cut it! I was in a state of extreme intense anticipation! The timing couldn’t have been better. Between the time I scheduled my appointment and the time it rolled around, I had been literally drenched (even smothered!) to my eyeballs in – no not butter – but STRESS!!! It goes without saying I was more than ready to see if my first visit would fulfill Sego Lily’s claim to renew my mind, body, AND spirit. If there was anyone to give it the test that day, it was ME! But I admit I was somewhat skeptical considering NO chocolate was involved in the process. Not even cocoa butter! As I entered the spa weighed down with my heavy load of burdens, I was greeted by my wonderful masseuse, Nichole, who reached out and cheerfully took them from me. I more than willingly handed them over to her, fully intending to retrieve them once again upon my departure. Upon my arrival inside the spa, the beautiful and peaceful surroundings made me quickly forget all about that bag of burdens that I entered with. I was warmly welcomed by the Sego Lily staff and shown around by Nichole. What an escape I was feeling already! I felt I had entered into a new realm for a time. Aaaaaah……. The exhilarating aromas (aromatherapy at it’s finest!) and the tranquil ambiance quickly took their affect. As the mother of five boys, I was not used to this. I am usually surrounded by loud noises, rambunctious wrestling, fermenting dirty socks, smelly gym shoes, sweaty uniforms, and many other unknown fragrances, that truth be told, I prefer NOT to know what they are OR where they came from! Ignorance IS bliss when living with boys. No nasty aromas at Sego Lily. Not a one. Just the intoxicating scent of lavender and mint and eucalyptus permeating everywhere. It was worth walking inside just to give my olfactory receptors a thrill. Wow! That royal feeling seeped inside quick! Even before I was inside my room, I was completely relaxed. The calming music softly playing in the background along with the serene sound of water flowing and dimmed lights made it impossible not to be. I was ready to be royally buttered pampered! I was not disappointed. The butter cream was so luxuriating and so intensely wonderful that I swear my body just slurped it up on the spot! Honey Dew Body Butter…mmm… Honey do more! Please! Never stop!”, was consuming my thoughts! The combination of that and the massage…OH THE MASSAGE! I thought I had died and gone to saturated fats heaven! Nichole’s magic hands and fingers found all the right places my stress was hiding. Against every instinct in my core, I fell into an almost vegetative oil state. I wasn’t asleep… heck I’m not that relaxed when I’m snoozing. But I wasn’t quite with it either. After being lavishly drenched in butter I was wrapped up in a plastic cocoon basting blissfully while given the most incredible neck massage known to woman! I emerged from my cocoon – not a butterfly – but a royal Queen Bee! Now I can NOT believe I am about to say this, BUT… this experience was even BETTER than chocolate! I know, I know….that sounds like blasphemy especially coming from me – the founder of Chocoholics Un-anonymous. But this truly surpassed any chocolate experience even I’ve ever known. Yes, better than any chocolate morsel that has ever passed through my lips en route to my hips, and yet this was 100% calorie free! Whoever heard of drenching anything with butter without inducing severe guilt laden calories? Hmm…I wonder if they’ve considered doing a Cocoa Butter Drench too? This healthy indulgence did more than fully RENEW my mind, body, and spirit! It soothed my soul, strengthened my body, and clarified my mind, just as promised. I was a new woman as I departed! My experience at Sego Lily lived up to it’s claim and definitely quenched my body’s thirst for serenity in this chaotic world! My bag of burdens remained behind. An enormous weight was lifted! As I flitted lightly out the door of that tranquil world inside Sego Lily, I felt completely ready to take on the world again… and with a new crown to boot! After all that pampering and drenching in butter, I felt like royalty, a real Dairy Queen! Do whatever you want with my bag of burdens Nichole. Maybe you should drench it in butter too! They have everything you need to tame your WILD LOCKS after a day of spa frolicking! They even sell the yummy butter so you can drench yourself in it at home when your skin gets thirsty! Sorry, they don't sell massages in a can! Fare thee well my Sego Lily lady! Parting is such sweet sorrow! But 'tis not so when parting with heavy burdens! I thank thee for thou hast taketh them far away! Not trying to butter you up… nope! BUT if you are in need of a vacay from your stress and burdens then allow Sego Lily to do the buttering up! They are really good at it!!! As always the proof is in the pudding butter!!! https://segolilyspa.com/wp-content/uploads/2009/06/june-09-0823.jpg 360 480 gwenn https://segolilyspa.com/wp-content/uploads/2018/05/Sego-Lily-Logo-2018-final-white.png gwenn2009-06-06 02:38:202009-06-06 02:38:20Burdens Banished by Butter! If ever there was a morning I needed a good buttering and drenching, today was it. I had left a husband making crêpes in my just-cleaned kitchen, my floors had sticky puddles on top of the sticky puddles that needed cleaning last week, and my laundry piles had physically eaten my laundry room. Engulfed. Digested. Gone. Burp. I was headed for ninety minutes of being slathered in something akin to butter, being wrapped in plastic and blankets until it absorbed, then I would be massaged until I was unconscious. (Maybe I added that last part) To say I was excited is to say the sea is wet; there may have been actual skipping as I got out of my car in the parking lot. The Sego Lily Mind Body Spa isn’t just pretty; it’s a knockout. The Palladio colors and architecture are reminiscent of something you’d stumble across in an Italian countryside, were you lucky enough to stumble across a wellness spa as you hoofed it through the Italian countryside. This isn’t a strip mall spa; there are no cheesy posters on the wall, no sixteen year-olds getting their hair blown out for prom in the front room, no smell of nail polish remover wafting or fluorescent lighting overhead. From the moment you walk through the heavy wrought iron doors, you get the message: This is an escape. 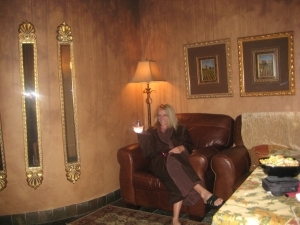 After I checked in and was shown to the changing room, I was given my eggplant chenille-lined robe and spa slippers and instructed to change and wait for my therapist in the relaxation room. I couldn’t get there as fast as planned – the changing room alone could’ve held my interest for twenty minutes. Spa quality face lotions and rinses, complimentary Q-tips, hair elastics, razors, deodorant, hairspray; that was just the stuff by the sink! There were showers, a steam room, a sauna – you name it. Had I somewhere to go other than home to my laundry room’s skeletal remains, I would’ve been set. Then, the relaxation room: They aren’t kidding; I was tempted to ditch the treatment and see how long I could go unnoticed on the huge, overstuffed couches. Low light, an assortment of herbal teas, hot chocolate, mints, fresh fruit and – get this – a melody of dried fruit on which I could drizzle dark chocolate syrup infused with antioxidants! Stop it, Sego Lily. You’re messing with my reality. After a few relaxing minutes and ample snooping, Kaylie appeared in her all-black attire and I mean business apron and greeted and escorted me to my room. So it began. This wasn’t my first rodeo, if you get my drift, so I assured Kaylie, as she walked me through the process, that this body had seen ample time inside a spa. How wrong I was – there are treatments, and then there are treeeeeeaaatments. Kaylie rubbed me in something that was literally the texture and consistency of butter, except it smelled like lime verbena and the aroma combined with the warmth of the room made me feel like I was lying on a beach somewhere, sun drenched to my toes. And did I mention the table was warmed? Warmed! The gentle heat radiated up from my underside and wrapped around me like a blanket – oh wait, that was the actual blanket Kaylie wrapped me in when she was through slathering; a cozy cocoon so snugly and moist I felt akin to a baked potato in foil, sizzling away on the oven’s top rack. While I marinated, Kaylie covered my eyes in an herbal mask (Yum, lavender. And again with the warming!) and massaged my neck and shoulders; there was contact with pressure points, pulling and maneuvering, and I was a limp noodle. Once I was peeled from my toasty shell, the massage began. I’d like to give you intimate details of the massage but it was a complete out of body experience and might’ve lasted minutes or days – couldn’t tell you. I was so relaxed, somewhere betwixt and between being asleep, that I only remember being rubbed and touched so wonderfully I felt completely at peace. And I forgot the dishes. And I forgot the laundry. I forgot the constant list that I write in my head every waking moment. And I just was. Ninety minutes from the start we were through. Kaylie was the quintessential massage therapist; speaking only enough to make me feel connected though never requiring constant dialogue. She was firm and confident and though she probably tips the scales at 90 pounds, she worked all 5’11’’ of me like putty in her hands. Once I pulled myself together and headed out the door, I let out a long sigh and reminded myself why every mother, nay every woman, deserves time to herself to indulge in something that makes her feel energized. Women deplete their stores on a daily basis; Sego Lily wipes the slate clean, if for only ninety minutes, so that we can take off our robes, suit back up and face the world again; or at the very least, the laundry piles. Woman, get thee to Sego Lily. Congratulations to the Five Finalists! First off, we want to thank ALL of the wonderful bloggers that entered. We could only select five but way more than five of you won our hearts and smiles with your fabulous entries. Thanks so much! After an INTENSE selection process we are very excited to announce the five finalists in the Search for the Sego Lily Blogger! And without further delay, here are your five finalists! How the Judging Process Worked? Narrowing down so many great entries required a bit more time and brainstorming than we originally anticipated. Here are some details on the selection process we used. To select these finalists we assembled all of the entries and distributed them to our five-person management team at Sego Lily. Each person on the team could nominate any entry as a “semi-finalist” which gave us a list of 14 of our favorite entries. The voting was EXTREMELY close, there was a .75 point difference between 6th and 5th place. Everyone that entered should be very proud of the wonderful work and we hope to see you next year when the contest begins again! All of our finalists have been contacted by phone and have a treatment scheduled, once the treatments are finished they will all have an opportunity to write a post on this, the OFFICIAL Sego Lily Blog about their experience and then the public will help us choose by voting (using the comment section of each blog post) for their favorite. The top vote getters will be ranked in order and this number will be averaged with a separate ranking by the Sego Lily Management team. The blogger with the top average score will win the title of Sego Lily Blogger and the dream year will begin. That Won’t Be the End! Be sure to subscribe to our blog for entertaing and informative information, stories, as well as special news, announcements and our monthly newsletter as well! https://segolilyspa.com/wp-content/uploads/2018/05/Sego-Lily-Logo-2018-final-white.png 0 0 Jake Garn https://segolilyspa.com/wp-content/uploads/2018/05/Sego-Lily-Logo-2018-final-white.png Jake Garn2009-05-26 17:32:202009-05-26 17:32:20Announcing the Finalists! We are overwhelmed by how many well written, creative, hilarious and fun entries we’ve received! We never would have guessed it would be this difficult to pick only five winners! Rest assured the judging is going on full-steam ahead and the five lucky finalists will be contacted and announced on this blog within the next week or two. In the meantime we hope all of you had a fabulous Mother’s Day. Mother’s Day is a very busy time of the year at the spas and rightfully so. You moms out there deserve all the thanks in the world for your thousands and thousands of sacrifices over the years, both large and small. My wife and I just found out we’ll be having a boy in September and I can’t even believe what women need to put up with to bring a new person into this big, tiny world! You moms were just built different, you’re like the best invention even before sliced bread. The judging will be wholly unbiased, but for all you moms out there that entered our contest, I’m rooting for you! We were so happy to host Fox13 and their wonderful crew at our spa all morning long, if you missed it feel free to catch up on all the segments below, originally aired live on April 16th, 2009. *Unfortunately the opportunity to take advantage of the exclusive offer mentioned has passed. 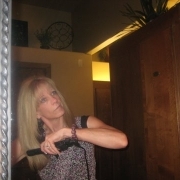 Utah Search for the Sego Lily Blogger! We have extended the entry deadline until April 25th, 2009! Please be sure to subscribe to this blog for future updates and announcements. The Search for the Sego Lily Blogger! Are you one of Utah’s Best Bloggers? Are your skills worthy of landing you the title of the Sego Lily Blogger? If the answer is yes then you could win the absolute ultimate spa package. 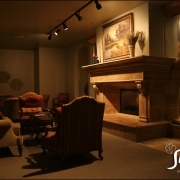 A spa treatment, every month for the entire year… at BOTH Sego Lily locations! A dream schedule of 24 of our most luxurious treatments, valued around $3,000. We cover the tip, we cover the treatment, and basically we treat you like royalty… the catch? You just have to blog about the experience and tell the rest of the world what it’s like to enjoy the most healthy indulgence of your life! Your Personal Blog is Your Entry Form! Entry is simple, post on your own personal blog about why YOU should be the Sego Lily Blogger for a year. Write whatever you’d like but make it entertaining, stylish and make it stand out! Also, you must post a link to this page at the end of your blog entry, that way all your friends and family can see what you are entering! We are looking for a blogger that is entertaining and interesting to read. We will judge all of the entries in three separate criterias, the creativity of your entry, your writing style, and last – the look and feel of your blog design. We will narrow down all of the entries to five finalists, these finalists will be given a free luxurious treatment, and all the tools (including Sego Lily logos, graphics and photos) to create a sample Sego Lily Blog post on and tell the world about their treatment! After the finalists have blogged about their experience the public will vote on their favorite. The winning blogger will turn into the Official Sego Lily Blogger, contracts will be signed and the dream year will begin! The winner will be the official Sego Lily Blogger for a year! You will receive a full schedule of regular spa treatments. Over the course of the year the Sego Lily blogger will be treated to our most fabulous indulgences including a variety of facials, body treatments, vichy showers, massages and pedicures. That’s not all, we’ll also customize a treatment schedule to address any indivual concerns you have about your skin or figure. Is that all, of course not! As an honorary employee of the spa you will also receive a variety of employee-only benefits, that we’ll be happy to share with you once you are selected! Question. Do I need to know HTML or be knowledgeable about web design? Answer. You do not need to be a computer expert to enter, and no, you do not need to know HTML or have any kind of technical knowledge to enter or win! Things like adding photos and making the text look good are easy to do without any knowledge of technical web design. Question. I’ve never been to a spa, can I still enter this contest? Answer. Yes, absolutely! Spa experience is not a requirement, if you win you will get PLENTY of spa experience! No purchase necessary! Must be 18 to enter. Must be willing to travel to spa locations at your expense for treatments (so we’d prefer you live in Northern Utah!) Winner agrees to blog about their experience at the spa in order to continue to receive complimentary treatments. Sego Lily blogger needs to be physically able to receive regular spa treatments, in the event that any conditions occur that pre-empt continued normal treatments, including but not limited to injury or pregnancy, then Sego Lily management reserves the right to replace the Blogger with an alternate. Sego Lily blogger agrees that all content generated for the Sego Lily Blog is the property of Sego Lily Spa and is created under a work-for-hire agreement in and exchange for services rendered. Sego Lily management reserves the right to replace the winner with an alternate finalist in the event that these conditions are not met. Other terms and conditions do apply, please inquire for full details. https://segolilyspa.com/wp-content/uploads/2018/05/Sego-Lily-Logo-2018-final-white.png 0 0 manager https://segolilyspa.com/wp-content/uploads/2018/05/Sego-Lily-Logo-2018-final-white.png manager2009-03-04 16:10:102009-03-04 16:10:10Utah Search for the Sego Lily Blogger!